Robin Hood for the BBC was created by Dominic Minghella and Foz Allan who have created the most interesting and unorthodox Robin Hood that has ever graced the small screen. Filmed in Hungary Europe, this 13-part BBC series tells the lives of Robin Hood and his merry men that is oozing with action, drama, romance with a touch of "soap" to really help draw the viewer into this series. 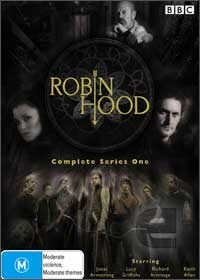 The star of the series is Jonas Armstrong as Robin Hood who returns to England after five years fighting in the Third Crusade only to discover that England has been thrown into turmoil during King Richard's absence. Unlike previous Robin Hoods, this new incarnation has a much darker side that is drawn out through the first season of Robin Hood. Add in the extremely talented Lucy Griffiths as Marian and the dastardly Vayset, the Sheriff of Nottinghood (played by Keith Allen) plus the classics such as Little John (Gordon Kennedy) and Will Scarlet (Harry Lloyd), the entire cast of this mythos has been professionally chosen to help portray the tales which have never aged. A great series for young and old alike. The video quality of Robin Hood is phenomenal and is filmed in pure digital for that true movie experience (16:9) and match that with Dolby Digital and you have one high quality series from start to finish. There is a plethora of special features available such as audio commentaries, character profiles and some short documentaries and there is plenty of value for your hard earned dollar. The only downside to the series is the occasional over the top acting but hey... it's Robin Hood and there should definitely be a touch of cliché and cheese!